This Quick Drying Large Mesh Beach Bag with Shoulder Strap is perfect for hauling all your Beach, Picnicking, or Kids sporting event items! click add to cart now! Large enough to fit all their toys, your towels, and anything else you need all while leaving your hands free for holding hands or carrying chairs..
Made with High quality PVCMesh. Designed with Dual Handlesand Shoulder Strap that have been reinforced with cross stitching for added durability and strength as well as freeing up your hands. Zipper pocket - on the inside to store your valuables. Large pockets on the outside and plenty of storage on the inside for all your beach going items. Flappable Bottom - to keep unwanted sand from getting in place it down. When it is time to go home from a fun day at the Beach flip it up to expose the mesh bottom and rinse all those toys off! Click ‘Add to Cart’ above to get a Versatile Hands-free Mesh Beach Bag with Shoulder strap that is perfect for the Beach, Picnics, Camping, pool, and more. 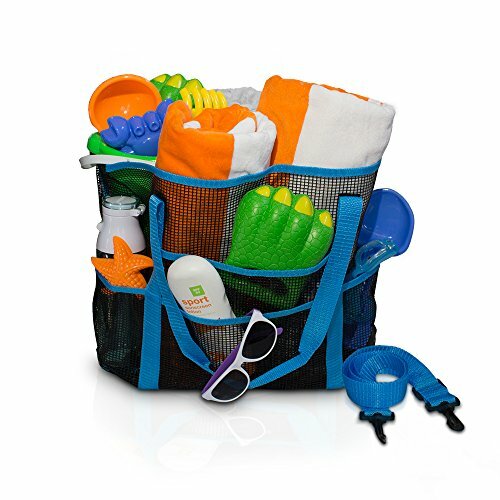 ✔️DURABLE LARGE BEACH TOTE - Space for everything, Beach towels, water bottles, sun glasses, beach toys, speakers and anything you need for a day at the beach, pool, park or campground. ✔️ LIFT UP SOLID BOTTOM - Your Mesh Beach Bag comes with a solid bottom to keep sand out. Once the beach toys have been played with and it is time to go home. That bottom lifts up to reveal the mesh below and allow easy cleaning of sand covered items. Quick drying as well! ✔️SHOULDER STRAP - When bringing the kids to the beach with all the beach towels, suntan lotion, and kid beach toys. You will over the convenience of a shoulder strap. This allows Moms and Dads to hold small hands while making their way out to that special place. ✔️BUILT TO LAST - This Large Mesh Beach Tote has a convenient zipper pocket to store your valuables, Velcro at the top to secure it closed, double and cross stitched throughout for extra durability and strength to last many summers at the beach or pool. ✔️ONE YEAR WARRANTY - If you don't Love your beach bag we will buy it back from you! No questions asked. If you have any questions about this product by Simply Things, contact us by completing and submitting the form below. If you are looking for a specif part number, please include it with your message.